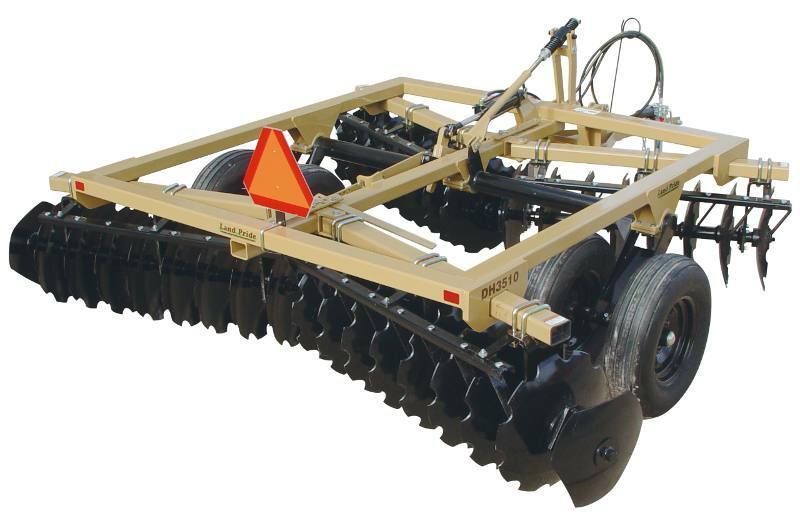 Land Pride's DH35 Series pull-type Disc Harrows are perfectly matched for seed bed preparation, soil pulverization, and tillage on smaller farms, ranches, construction sites, race tracks, rodeo grounds, nurseries, reclamation sites, and sod farms. Economy-conscious customers will find them more than equal to just about any soil cultivation task you can throw at them. 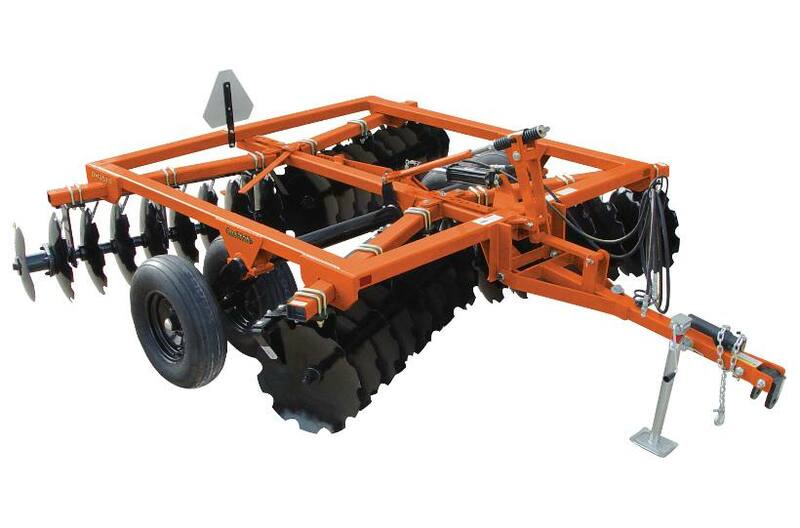 With choices of notched or smooth 20" or 22" discs mounted on front and rear gangs that have easily adjustable angling, the DH3510 and DH3512 readily adapt to a wide range of tillage conditions. Pull-type clevis hitch attachment: Allows easy one person attachment to a wider range of lower priced new or used utility tractors. High weight per blade concentration: Makes for easier disc penetration. Heavy duty carrier frame and tongue construction: Provides for years of dependable service and performance. Single pin release and lock on five position gang angling front and rear: Makes gang adjustments for less or more aggressive tillage an easy task. Notched or smooth disc selection in 20" or 22" disc sizes: Lets customers choose a configuration that’s just right for their tillage task. Greasable triple sealed disc bearing: Provides for ease of service and longer bearing life. Large transport tires with option of adding two more: Provides capability of road and field transport over tough surface conditions. Hydraulic depth and transport control: Goes from working to transport position and back again with easy single tractor hydraulic control lever manipulation. Front to rear leveling system: Provides uniform front to rear disc gang penetration. Optional dirt Scrapers: Keeps discs from balling up with sticky mud. Optional 18" and 20" furrow filler blades: Provides for more uniform finish on multiple pass applications. Optional center sweep kit: Provides more consistent uniform finish between gangs. Optional tongue jack: Assures easier hitch attachment to tractor. 2 Rear disc choices: Choose Notched or Smooth rear discs to achieve your desired finish. Weight with 20" discs on 7 1/2" spacing & no other options: 2,491 lb. Max. cultivation width: 10 ft. 6 in. Approx. Approx. weight load on each blade with 7.5" spacing: 79 to 84 lb. Approx. weight load on each blade with 9" spacing: 87 to 93 lb. Disc blade spacing: 7.5 in. or 9 in. Forward gang angle adjustment: Single pin adjustment to 15, 16 1/2, 18, 19 1/2, or 21 deg. Rear gang angle adjustment: Single pin adjustment to 12, 13 1/2, 15, 16 1/2, or 18 deg. Transport: 10 ft. 10 in. 7.5 in. or 9 in.